This past weekend saw me hooking up with Ben, Matt, Ruth, Claire and Mark for a bit of Mountain bike adventure in Mid-Wales. 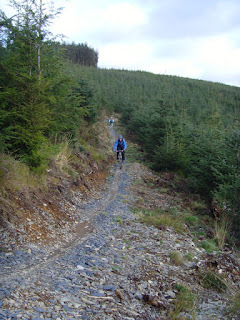 The plan was to ride the Cli-machx trail at Machynlleth first, back to Claire's house in Llanymynech for a curry and then head out again on Sunday to ride at Nant-Y-Arian. After the normal wait for Mr White ( who even after purchasing a new super fast A3 still can't get anywhere on time ), we left Mark and Claire to board the loft and headed out in convoy to the Ancient Capital of Wales, Machynlleth. 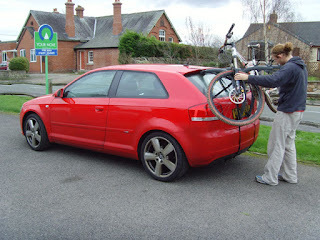 Finding that place was easy ( seems like most roads in Mid-wales lead there! ). However using a dodgy bike map to the Cli-machx trail lead us up some interesting tracks before the Force was utilised to get to the car-park at the bottom of the trail. 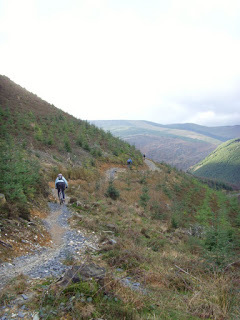 The Cli-machx trail has been bigged up a lot recently, designed and managed by the Dyfi Mountain bikers it had an impressive reputation ( the longest downhill in Wales? ). Truth is, compared to other managed trails it rates as 'OK'. There are plenty of little jumps and stuff to keep you interested, but too many of the sections build up to nothing and on a couple of occasions you feel a little cheated. The final downhill is a bit of a gem though. Lots of nice drop offs, fast berms and some very cheeky North Shore ( if anyone knows how to get to it without walking can you let me know! ). It is just a pity the rest of the trail lets the whole route down. After a quick stop in 'Mach' for a pastry we headed back to Llanymynech with empty bellies hungry for curry. After a quick pint in the pub, Claire persuaded/reminded/dragged us to the local village hall to hear a delightful Silver Band ( like brass, but silver? ). It was for charity though and their version of Bohemian Rhapsody did get the blue rinses headbanging! Soon after ( well in the intermission ) we were all in the curry house, toasting our day and filling our toned six-packs with calories in preparation for the next adventure. After a night on the floor with Claire's cats, we loaded up the wagons and headed to Nant-Y-Arian, which is practically a stones throw from Aberystwyth. We were greeted by a hanging damp and cold wind. 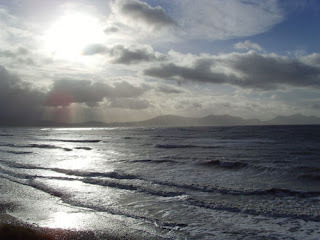 I know it is January, but what is wrong with a little sunshine? Playing around in the car park I managed to destroy my chain and for a moment I did think I would be sitting in the car park. However, Mark the Mountain Goat came to my rescue with his box of tricks and bodged it together to last the ride at least. From the off the Summit Trail is a blast. ( we actually did the whole Summit Trail plus a couple of sections of the another trail at the top ) Flying off the boulders on the 'Italian Job' with jelly legs right at the beginning is a great warm up and it just keeps going. The crux of the whole trip is an awesome alpine-esque downhill traverse. Great exposure, lots of whoops and plenty of 'nearly lost its' make this section of trail well worth the trip. OK, it is followed by a 2 mile uphill ( with a pointless off-fire-road section called 'Emmanuelle' ), but I will be heading back to 'Nanty' as it has plenty for a good days riding. The only bad thing from the whole weekend was the management of the centre at Nant-y-Arian. 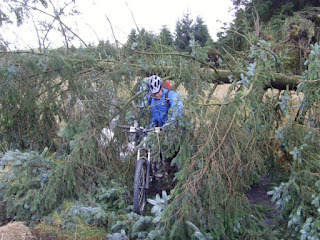 I suggest they take a trip to Llandegla and see how you should manage a popular centre. The car parks were still full when we got off the trail at 15:30, yet they had closed the cafe 30 mins earlier. What is the point in having a centre and not catering for the needs of the users? Short-sighted would be an understatement. Weekends are getting a little booked up at the moment. It must be something to do with a little get together we are having at the end of March? With this in mind we set the alarms for 07:30 on a Sunday morning and headed out to North Wales to get some fresh air and space. 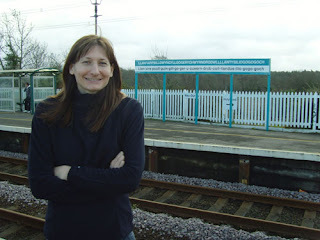 First stop was the World Famous Welsh Village of Llanfairpwllgwyngyllgogerychwyrndrobwllllantysiliogogogoch. 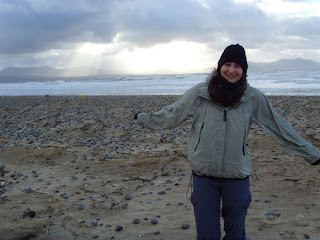 No that is not me having a little fit whilst typing, it is a little village on Anglesey. Nothing much there of course, just a railway station and a row of shops. Rumour has it an American came up with the name anyway! 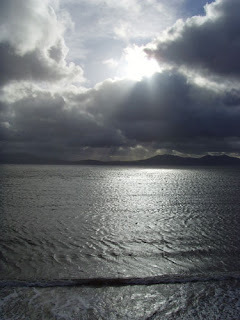 The grand plan was the walk from the Village of Newborough to Llanddwyn Island ( an area I have sailed and sea kayaked around ). 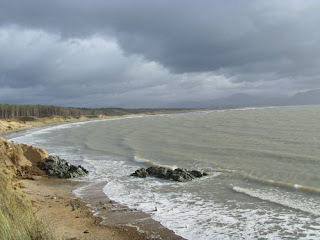 However, with the lack of facilities in Newborough we parked in the forest and just spent more time out walking along the beach and sand dunes. Unfortunately the tide and prevailing wind prevented us from getting onto the Island ( the little spit of sand joining it to mainland was under water ), so we will have to go back there another day. 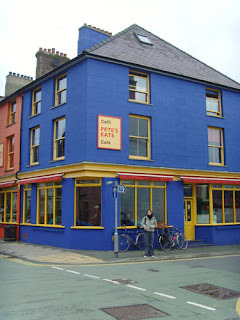 With red windblown faces we headed to the legendary climbers cafe in Llanberis called Pete's Eats. Without a doubt this is the best cup of tea you will ever taste. 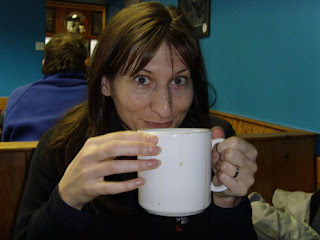 Maybe it is the oversize mugs, maybe it is the location ( at the base of Snowdon ), either way this is one of those places I have been going to for years and will be going back for years to come. Just a pity the old 'Outside' outdoor equipment store has closed down as that was a good store during my uni years. 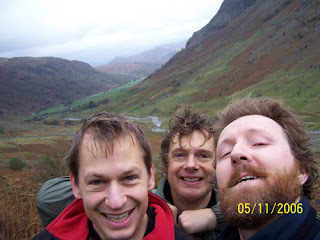 This is Wrennie's rather marvellous write-up from a trip I did with him and Darren last year. I have left it totally un-edited, so be warned! We broke away from the inspiring scene to carry on our journey up into the hanging valley to find a camp at the foot of Styhead Tarn. 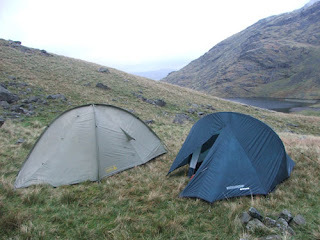 I was surprised to see, as we finally approached, I was surprised to see a couple of tents pitched round the Tarn, we found a secluded spot above the Tarn to our right which looked out over the dark mythical waters to an opening vista of dark mountains. Our choice was good, next to a ruined sheep pen which acted as our front room. 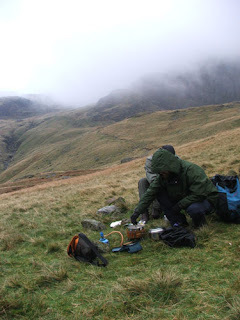 We sat and cooked up some packet pasta for tea, cheese and broccoli flavour, had with some wraps and topped off with flask coffee. Of course we had come prepared so cracked open a fine bottle of Malt. Two thirds of a bottle and a couple of bad boys later I found myself walking with my chums across undulating fell, bathed in moonlight in search of the open view across Wasdale, the flats and onto the lights of Whitehaven. We were not disappointed stood still being buffeted by the night breeze, staring into the darkness. With a snap of the fingers we were back at camp tucked up in our sleeping bags. 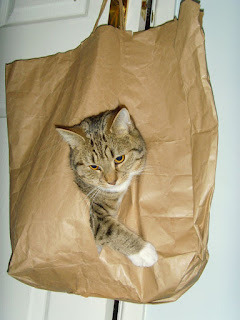 I had decided in the interests of packing light to take a very thin sack as it squeezed very small, to boost its effectiveness I had purchased a fleece liner, equally as small. Though I slept the night in long johns, socks, thermal top and thin fleece my arse was cold all night. It didn’t help to have made a critical error in thinking that I needed to inflate my roll mat to a hardness not unlike marble. I was lulled to sleep by the roar of the Robinson. We rose late in fell top time on day two and after a shared pan of hot porridge and banana we hit the track at about 10.30am. The crisp clear night had given way to a damp grey day. The tops were lost, soaked up by the clouds. 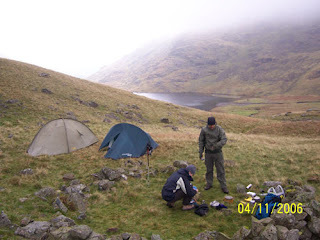 We left, with Styhead Tarn on our left, as the track rose we were soon engulfed. At first, by wisps of grey, hiding sizable sections of landscape for a short time, then moving on. It wasn’t long before our vista had shrunk to around 20 feet before disappearing into the soup. We pushed on round the back of Great End with a purpose to our stride. We bore right with Esk Hause at our sides, keeping to the path, led by each emerging carne from the fog. 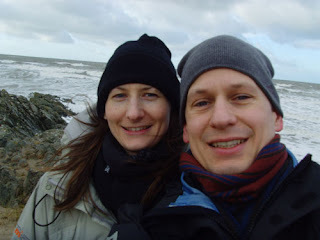 We were clad in our rain coats and gloves by this time, as there was a howl to the wind, yes a bite to the air, though not raining, there was a heaviness to the durge. The path steepened and then levelled to a plateau of boulders, a lunar landscape. The path only visible by the carnes, and a smoothness to some rocks. It needed an amount of balance to negotiate the wet stones and a certain telepathy to stay on the path. Our landscape materialized into a steep decent with no change to the terrain until it levelled to a saddle. It was here we decided to take a more substantial rest and cracked open the flasks, chocolate and I tanned the rest of me mornin g reefer. We had sought some small sanctuary from the elements among some rocks and sat for some ten minutes or more. Time to move on, we heaved our bags back on our backs, the burden we must carry to conquer England’s highest peak and began to climb, or so I thought. In all the mist and murk I had visualized the wrong saddle of mother Earth. The terrain instead rose gently and then again there came another steep decent, this time the land was narrower and so the saddle. And there before me was the climb I had been expecting. Without our packs I think we would have taken a more challenging route up, instead we stayed to the path and steadily gained height. The highest most point of England had rightly been achieved. 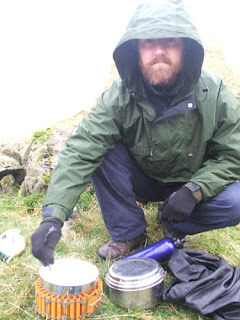 Amongst the mist and boulders we shielded from the wind, with our backs against the stone platform that is Scarfell summit, we ate piping hot mug’o’noodles with tortillas. There sweet and sour flavour was most divine. While sat gazing into nothing and loving it an elderly gentleman summited. By the look of his craggy face and grey well kempt beard he was military. Retired for sometime, but keeping himself trained. Years of combat had yet to leave his head and quite probably never will. He stood, with the wind at his face being peppered by light rain and stripped from the waist up. He dried himself, the towel was of a pleasant shade of blue, and donned fresh clothes, jacketed back up and donned a warm hat atop his head. With a foam mat to protect his buttocks he sat and drank from his flask. 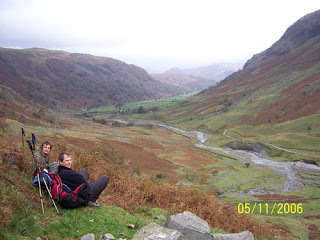 Our noodles warming in our bellies we shut up shop and began our long decent into the Wasdale valley. Consumed by murk, the thought of the pub pushed us on through what seemed at times, a throng of people asking, sometimes in desperation, “how long to the top”. It was always greeted with the same exaggeration of the truth. The steepness of the decent meant it was not long until the grand landscape became visible again, first in just pockets of mother natures beauty and then huge vitas to the horizon. Myself and Darren had somehow allowed someone to insert blades into the tops of our knees, causing them at times to bend…..the other way! Tim was steadfast with his youth. The steepness of the decent made us wonder why people would approach the mountain from this staircase path, even if they were in slim trainers and designer anoraks. Its steepness had one redeeming quality in its speed; we reached level ground in no time. A mile or so of tarmac road guided our weary bodies towards the pub. Just how weary, we were to find later. The pub, the pub, here come the pub. Sanctuary in good ale, warmth. The calming hum of jostled voices. So soothing, our beds felt right at 4.45pm. Time: 3.30pm. Place: A small field adjacent to the pub. The walk was done, our longing for the pub was almost over, and we could taste the reward. We set up tent, close to the dry stone wall in an effort to shield from the wind and quickly waddled our way into the pub. The air was warm and heavy with voices. We ordered up a couple of pints of real ale for me and Tim and Daz had a Paul Weller, we found ourselves some bench seating. The majority of the place has an air of 1940’s train station, it echo’s. It’s 4pm now, the first pints are all but consumed and the wicked weasel of weary begins to make its way through the body. I was fatigued. I’m talking straight out bolloxed. Don’t get me wrong, it was a great feeling, I would say euphoric. I knew that time was not on my side; I was not long for this world of awakedness. And I could see by the glazed expressions of my companions we would leave as a team. But before we did……we just had to fight it. Another pint was ordered along with dinner. As if by some kind of chef magic, or Doctor Who time lord Tomfoolery our meals were delivered to the table. When presented to the eye it encouraged a feeling of mountaineer, a battle against the elements deserved such food as this. Tim’s fancy was a bean chilli, for Robbo the mighty lasagne accompanied by its oldest of friends, salad and garlic bread; back of the net. And for me, a beef in local ale pie. Every mouthful bought such pleasure, every swallow closer to sleep. Our second pints came to an end as we fell back into our chairs, And so we began to speak of bed. That so longed for long night supping ale in merry banter be but a memory to fatigue. Still we put up a fight, ordered another round and discussed a respectable time that grown men can confidently go to bed. The consensus of opinion was 7.30pm. So this was our struggle and it was 5pm. Needless to say we held out for our goal. Tim and Darren had another pint while I struggled pitifully with my third. When 7.30pm rolled round, that was it, we hauled ourselves out of our chairs and wad limped back to our tents, banged down a badboy and hit the hay. By 8pm I had been lulled to sleep by the roar of the Robinson. We woke early, 11 hours sleep had revived the body to some degree. We broke our fast with hot oats and banana and for the final time shut up shop. With my pack weighing like an injured deer upon my back it was time to walk off the aches and get out of dodge. The long hike out of the valley back to Styhead Tarn, and a rendezvous with a green Citroen. iPod Shuffle ( Mk.2 ) - do you need anything more? It has taken me a long time to become a member of the iPod generation. This has mainly been due to me not really needing one, after all I drive to work ( enjoying Chris Moyles and turning to Xfm when that plonker Scott Mills is on ) and I don't really spend that much time in a situation where I need to listen to thousands of MP3s ( or Apple AACs! ). This said I did make the upgrade to a Sony Ericsson W800i 'Walkman Phone' last year and I have been using it in the gym ( though it is a little bulky ). But still it isn't an iPod and never will be. Then it happened....those design monkeys at Apple came up with the Mk.2 Shuffle. An iPod which I could actually use at the gym, on my mountain bike or anywhere else. Relatively cheap, stupidly light, easy to use and small as anything. Being sensible I bought one for Vicky from Apple for Christmas...and she bought me one too! ( both using the free engraving option of course ). I managed to get 187 songs on mine, including the new Tenacious D album, the classic 2006 Wolfmother Album and of course the School of Rock Soundtrack ( am I too cliche these days? ). Team it up with a Crumpler PP40 case ( which can also hold the USB docking station ) and it never leaves me. 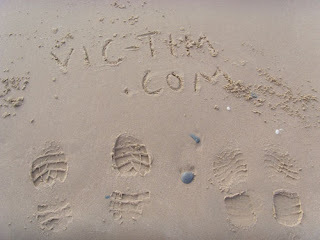 Thank you Apple and thank you Vicky! 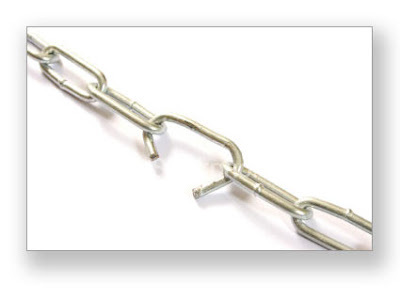 Chain Mails - Break the Chain! Got into another discussion today about chain mails and how they are the scourge of the internet. This time it was a mail based on some very loose journalism concerning the future of road tax. This text is featured on a plethora of blogs and forums ( so I will not be posting it here ). For those Science Nerds out there, look at e-mails and forums as Richard Dawkins does...question everything! The basic truth is if an e-mail asks you to 'send it on' or 'add your name to it' or even promises a freebie, it is nothing but chain mail spam. Ignore the heart wrenching or politically motivating topic, the sole purpose of a chain mail is to make the author feel powerful as their 'product' wings it's way around the internet. If you are in any doubt, take one bit of text from the e-mail or forum post and type it into google. It will come up as a chain mail somewhere ( I've been playing with the net since the days of gopher and so far I haven't been wrong on any mails I have highlighted! ). This website has all the information you could possibly want. Check it! Why work, but can you drive? 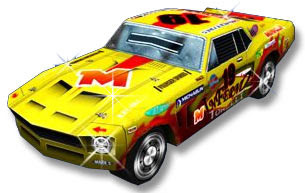 Why work when there are excellent sites like miniclip, so you can avoid all things work related and play games online? This is my new favourite Stunt Driver, but also check out the MotorCross games, they are well worth a click.